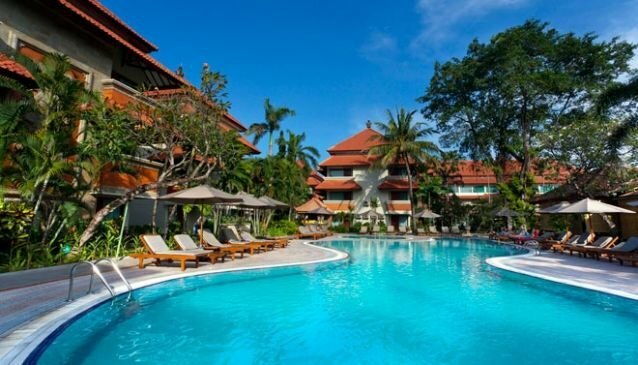 White Rose Hotel is 4 star property at the central of touristic destination, Kuta-Legian, managed by Sun Island Hotels, which offers luxurious Balinese accommodation at affordable value in 150 newly renovated rooms and 5 newly built Pool Villas. Set among 1.6 ha of lush tropical gardens, the White Rose Hotel is located in the heart of Kuta-Legian area, within walking distance of the famous Kuta Beach, a short distance from the Ground Zero area and Poppies Lane 2, famous clubs such as ViAiPi and only 10 minutes away from Ngurah Rai International Airport. It is the most entertaining street within Kuta, packed with art shops, restaurants, bars and nightclubs. Health club - Sauna - Full-service health spa - Bar/lounge - Free parking - Free breakfast - Restaurant - Barbecue grill(s) - Wireless Internet access - Swimming pool - Rooftop terrace.